You have no doubt heard the term “it was music to my ears”. Two of my colleagues from opposite sides of the world have applied this phrase and other musical concepts t o communication, conflict resolution and leadership. Brian Fraser, of Jazzthink, uses jazz as a metaphor for leadership. He likens traditional leadership to a symphony orchestra (in which the conductor is clearly in charge and musicians play on command). He believes that contemporary leadership, however, is akin to jazz. In jazz, players work from a central, shared theme, but take turns leading and supporting, in a continuous, unscripted flow. Brian believes that teams function most effectively by engaging in conversations that mirror the approach of a jazz group. 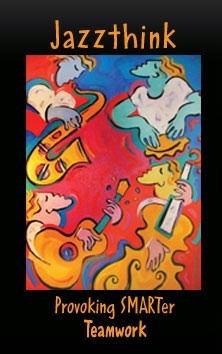 Check out http://www.jazzthink.com for more info. From England, Neil Denny, who I had the pleasure of meeting in Seattle recently at the Northwest Dispute Resolution Conference, combines his practice of collaborative law with his love of music. His book, Conversational Riffs: Creating Meaning out of Conflict, draws inspiration from great blues guitarists, such as B.B. King. He explores new and effect “riffs” as alternatives to the all too familiar Attack, Defend, and Count-attack responses. He also includes a section on the Drama Triangle and how “acknowledgement riffs” can help us move beyond the familiar victim/villain/hero roles. Check it out at: http://www.conversationalriffs.com.